Monday, July 4th, is Independence Day in the United States. 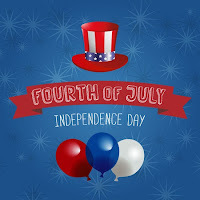 Also known as the Fourth of July, this date commemorates the Declaration of Independence from Great Britain. This is a festive day for many Americans as they celebrate with fireworks, parades, fairs, concerts, picnics and family reunions. It's a fun and proud day for Americans so get your students talking about the history, the culture, and the traditions of the United States!